The Fourth Sunday of Easter might be called Good Shepherd Sunday. It always includes Psalm 23 and something from John about the Good Shepherd. Go to Fourth Sunday of Easter (Year A) for background on children’s understanding of this image. U This is the only non-shepherd reading for this day. In it Peter gives the Council basically the same sermon he gave the crowd after healing the lame man in last week’s text. Before reading either sermon it is essential to present the story of the healing. Go to The Third Sunday of Easter (Year B) for two suggestions about how to do this. Use children’s blocks to lay a foundation for a square building. Start with a misshaped block at the corner letting it lead the walls off square. Ponder the problem. Then replace that cornerstone with one that is square and rebuild the sides of the foundation. Having looked at the two cornerstones, reread 4:11 to see what Peter is saying about Jesus. If you have a cornerstone in your church, display a large picture of it. Tell how it works. If it has a cross or other faith reference on it, point them out and note how they set the direction of the church. After talking about cornerstones, sing “Christ Is Made the Sure Foundation.” It is filled with language children will not understand, but begins with a reference to Christ the cornerstone. Before singing, point out this reference and put the first verse into your own words. U Psalm 23 has already appeared several times in the Revised Common Lectionary Years A and B. Use the links below to gather ideas from them. Go to The Fourth Sunday of Easter (Year A) for a reading of the psalm thinking like a sheep and the catacombs painting of Jesus the Good Shepherd which is the first picture we have of Jesus. The catacombs are narrow, twisting underground tunnels. The walls are filled floor to ceiling with graves that have been dug out of them. They are dark and spooky. Imagine walking quietly through them with a small oil lamp to find Christian friends who are gathering to worship by a designated grave. Listen for the clank of soldiers’ armor as you go. Given this it is easy to imagine why someone painted on the ceiling a picture of Jesus as a strong young shepherd who would take care of them. BTW - the image in the Year A post is a scan of a postcard I bought on my 1974 trip. The image at the top of this page is the same painting, but comes with permission from the Vanderbilt University collection. Go to The Fourth Sunday in Lent (Year A) for a child’s view of the usual Psalm 23 hymns, a coloring sheet idea, information about shepherding tools, and a reminder about cups that overflow. Go to Year A -Proper 23 (28th Sunday in Ordinary Time) to explore the feasting image in the psalm and God’s promise to be with us even in the hard times. U To help children pay attention to the verses of Psalm 23, display a different colored sheet of construction paper for each page. The rainbow page is either the multi-colored sheet that comes in some packs of construction paper or a home-made sheet with stripes of all the other colors. You could write the verse on the back of the sheet so that you can read from them as you display them. After reading the whole psalm, go back to the rainbow page to ponder the truth that God is with us, caring for us like a good shepherd. Yellow Surely goodness and mercy…. U Children’s version of 3:17-18: If we have all we need and see another person who has nothing but do not share what we have, we cannot say we love God. Love is not what we feel, but what we do. God wants us to love each other with actions. Children hear this literally which is appropriate. The challenge to us as adults is to speak honestly and early about their responsibility to share with others. Several years ago the local paper ran a series it called the Teen Distinguished Dozen. Each day an article featured the service of one teenager in the community. Every single one of those teens noted that they began serving others during elementary school. 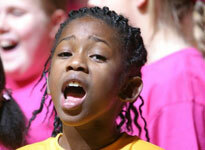 We in the church should be helping all elementary school children develop the service mindset. So talk literally about the verses with the kids in front of the adults. Be ready with specific ideas for kids and their families. Direct them to sacks printed with grocery lists for the local food bank. Suggest that they make lunch for a Habitat building crew. Send them to the Church World Service website (http://www.churchworldservice.org/site/PageServer?pagename=kits_main) to learn about the many kinds of disaster response kits needed by Church World Service. U There are many ways to “lay down your life.” Jesus allowed himself to be killed. But we lay down our lives every time we set aside what we want to take care of the needs of others. For example, when you set aside your game or book to play with a younger sibling so your parent has time to do something that needs to be done that is a way of “laying down your life.” Children also need to hear Jesus’ insistence that if he lays down his life he can take it up again. For them it says that giving up what you want once does not mean you will never get it or that you will always be called on to give up what you want. Adults have learned that, but it takes a while for children to learn it. This passage can help them. - About halfway into the film an old sheepdog explains his view of his job and his disdain for the sheep. He emphasizes the importance of letting them know who is boss. 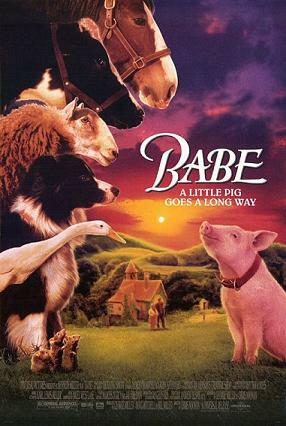 - Just past that there are several scenes in which Babe listens to the sheep and learns why they call all dogs “wolves” and why they hate them so. He also learns that if you ask sheep politely, they will do what you ask. - The film ends with championship sheepdog trials. In one scene, a dog herds the sheep by nipping at them. Then Babe speaks to the sheep respectfully telling them what needs to be done and they do it. U Use toy sheep, a cardboard pen and a small shepherd figure to demonstrate the shepherd calling the sheep by name as they go out into the field to graze under the care of the shepherd and later return to the sheepfold. If you have a wolf figure, also demonstrate the shepherd coming between the sheep and the wolf rather than running away. 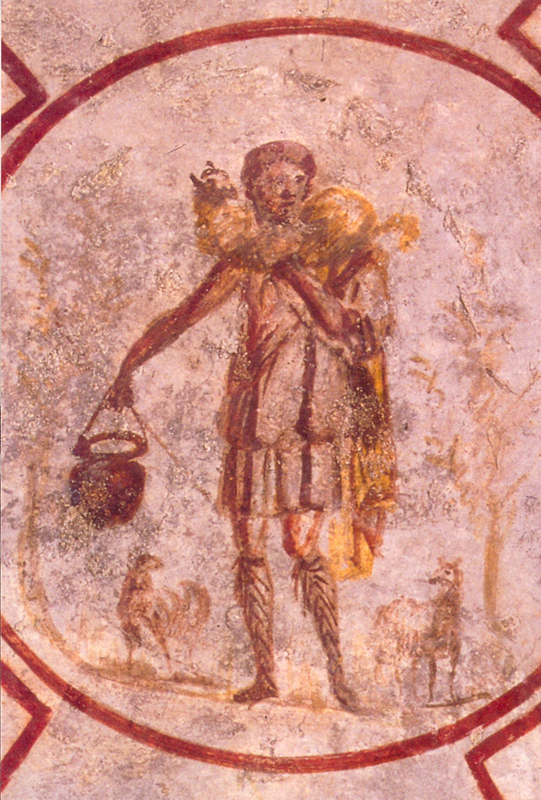 If your congregation uses the Young Children and Worship program, borrow the figures for Story #39, “The Good Shepherd and the Wolf.” Children who have been through the program will grasp more fully the program’s connection to worship in the sanctuary when they recognize this story that is told in both places. Thanks for "The Stone" video, Bonnie. Not only does it connect to the cornerstone, but the repeated "Ascribe greatness" echoes the first two verses of Psalm 29. So there are all sorts of possibilities!